We are proud to announce the release of our new, all color, backdrop catalog, version 4.11. We take pride in offering one of the industry’s largest collections of hand-painted backdrops. We have been producing scenic backdrops and theatrical scenery since 1904 in Columbus, Ohio, USA. We currently have over 650 designs in our inventory, ready to be shipped to your door. Our catalogs are available in pdf so you can browse our entire collection. Please click here to subscribe to our color catalog. We have an extensive collection of scenic backdrops available for rent. Backdrops rent for $350.00* base rate per week, plus freight. All rental periods are based on the time out of our studio. Please call our rentals staff for longer term discounts and availability. Our backdrops sizes are noted in the catalog along with a brief description, and approximate shipping weights. Most of our scenic backdrops are 43'w x 20'h, sized to fit most theatres, performance spaces, and special events venues. We also offer some of these backdrops in 30'w x16'h for smaller venues, such as churches and smaller theatres. Our rental backdrops are designed to be used indoors only. We can now set up all shipping and return service using our UPS online system. All shipments via UPS, including scenic backdrops and other theatrical supplies, can be tracked directly "door to door" using our "Schell Track" order feature. Our staff is available to help you any way we can, to make your next production a truly special event. Feel free to call us for more information, as we are constantly adding new drops to our collection. 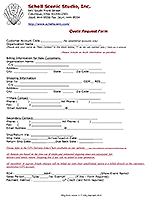 Please call us for rentals availability during our regular business hours, or use this online fill-in form to submit our Request for a Quotation. We appreciate your interest on our scenic backdrop rentals and look forward to serving you. We welcome you to visit our facility when in Columbus, Ohio, USA. * Prices subject to change without notice. Seasonal rates may apply. For your convenience, you can now browse our catalog of backdrops online, organized by theme. Our themes are only suggestions, and you may find the right backdrop in a category you might never envision. If you require any assistance in selecting a particular backdrop for your event, please check out our Play Backdrop recommendations, based on years of customer requests. If you need more personal help, don't hesitate to contact us. Website last updated on 01/31/2018.